Get Some Strings with Your Ting Tings! One Lucky Blog Reader will get 2 Passes! BragginBilly here again. For those who took some time to peruse my old blog, you already know that I think rock n' roll cello is pretty cool. So imagine my surprise when I was checking out the lineup for this week's sold out Ting Tings Show (Thursday, 6/19) at Great Scott. OPENING ACT: Apart from John Cale of The Velvet Underground, I knew exactly zero other viola, not to be confused with violin, players. Anni Rossi officially makes two and also makes a hell of a good reason to get there early for a very cool performance. I don't know a ton about Rossi, other than that she's from Chicago, she's "possibly" 22 and she's a one-woman band. She does a mix of strumming and plucking with some cool rhythmic foot stomping. From the variety of YouTube videos of Anni, she is a quirky and entertaining performer. Check out her videos on youtube. If you dig Regina Spektor you will certainly dig Anni Rossi...other people add Joanna Newsom, but personally I don't hear it. This Thursday at Great Scott! Email Us: Subject Line - "Anni Rossi & the Ting Tings"
You can't win if you've won anything in the last two weeks. Oooh I enjoy amped strings as well - sounds cool. There's a girl in Eksi Ekso who plays plugged-in strings, but I'm pretty sure it's a violin. Anni Rossi is quite unique. The Newsom comparison comes from her vocal range. Live she is quite astonishing & really owns her instrument. On CD (mostly self-released thus far, with a 7" on Too Pure & an album proper due) she plays with form & genre & sometimes is backed, sometimes is not, by a full or partial troupe of musicians. 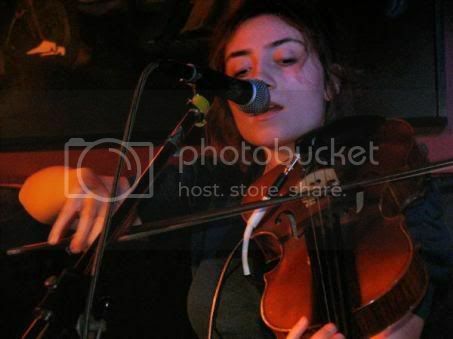 She doesn't just use Viola either - pump/pipe organ, guitar/piano/+ others are utilised on record. She creates an expansive sound from a minimal undertaking. It's quite panoramic. She met The Ting Tings in Manchester (UK) when she was in residency. As a result they offered her the support slot on this current N. USA + Canada tour. Anni is a friend of our radio show (The Waiting Room, ErrorFM) & we put a gig on for her a few years back in Cardiff, UK that introduced her to the Too Pure record label.